Brace yourself for the next Ipsos MORI poll! 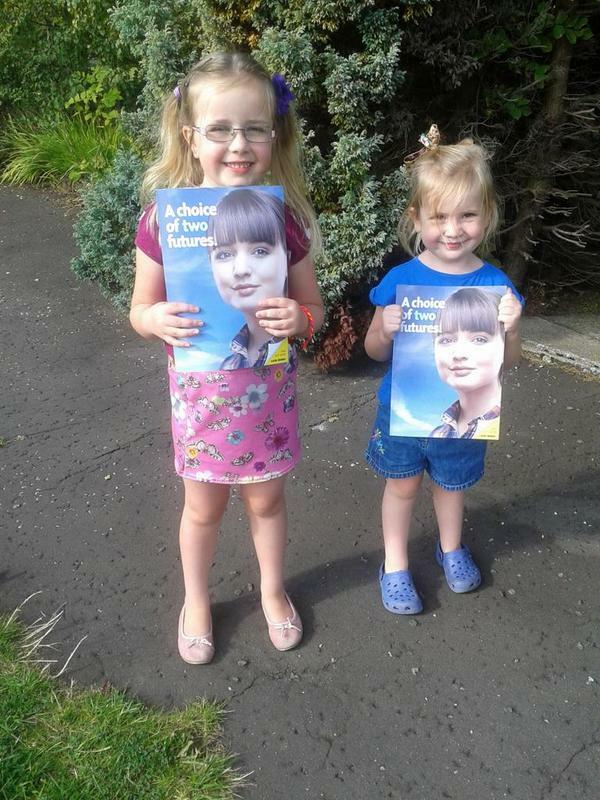 My daughters were doing what they could during the indyref, too. Although the opinion polls are shifting towards Yes, they’re moving at a snail’s pace. (The most recent one had 47.5% Yes vs. 52.5% No.) I personally find it puzzling that no matter what horrors the Tories throw at us, most of the No voters don’t seem to be reconsidering their position. It’s particularly strange because the months since the referendum have seen the huge landslide towards the SNP, so in many polls this party is now more popular than independence (and that’s ignoring the other Yes parties). The problem with this is that we’re unlikely to get a new referendum until Yes is significantly ahead of No in all the polls. I don’t think there’s a magic number as such, but Alister Rutherford’s argument that we need 60%+ is pretty sound. Not only that, but we can’t expect the Tories to listen to the 56 SNP MPs unless they’re backed up by a convincing majority in Scotland. As long as they know that we wouldn’t dare call a new referendum, they can effectively ignore Scotland and concentrate on making their Southern English voters happy. We have to grasp the nettle: We need to start campaigning for independence again. We must find a way convince 5-10% of the No voters that they should join us. If we can also make them support one of the Yes parties, that’d be great, but I’m actually more interested in their support for independence than in their party-political allegiance. In fact, it might even be helpful to ensure there are independence supporters in all parties and none. I’d love us to create some huge Yes events where we can all meet, like the wonderful independence marches in Edinburgh. Recent Yes events seem to have been organised by far-left groups and mainly shunned by the main Yes parties, so the SNP and the Greens need to take ownership of them. Perhaps the best way forward would be to resurrect Yes Scotland — not as a high-cost PR organisation, but as an umbrella group that organises marches and other events and creates Yes materials (badges and car stickers and so on). Like the old Yes Scotland, it could effectively be controlled by the SNP and the Greens. I know many people are tempted to focus always on the next election, but this means that we keep focussing on the parties rather than the cause itself. If we want independence, we need to campaign for it. We can’t simply wait for the next referendum to be called. Not everyone is on the ,NET How do we know the YES figure when there are so many out there who DO NOT know what is going on. Not everyone is aware of the call for INDY 2 or UDI some ( possibly elderly ) don’t know what UDI is. More info required door to door etc to spread the word. There is another way , the EU referendum will block EU members living in the UK from voting in the referendum ,undemocratic yes , but a yard stick nonetheless for all future referendum . So why don’t we just make it a vote for Scots only in the next Indy Ref. Simple solution and almost a guaranteed Yes . If its good enough at UK level then its certainly good enough for us .